The temple is mounted on round circular piers and there are two cabinets at the base area where you can place your puja essentials.Above that there is sliding tray for lighten up diya or incense sticks.Above that there is main place for the deity and carved pillars at the front. At the main place of the temple there is plywood work done at the base and wooden jaali work is done at the back of the temple. At the top of the roof there are three domes placed in which holy word “OM” is written with floral carving over there. 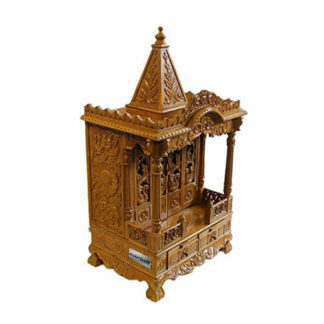 The temple is beautifully carved by our skilled artisans and it give very traditional and sophisticated look to your home.We use best quality of seasoned wood with fine finish.